Tips & Tricks to Fix Blue Screen Memory Dump Error in Windows: The ‘Blue Screen Error’ is often referred as BSOD i.e. ‘Blue Screen of Death error’. This means that your PC is in severe problem and you need to do some fixing for it. It is also one of the most common errors found in ‘Windows’ Operating System. It appears whenever the system gets rebooted or there is some heavy load on your PC. During this error, the PC does not run smoothly until it is fixed. The system becomes slow, laggy and inefficient. It can also crash your windows and if neglected, can ruin your system too. So, its better to fix it as soon as possible. But at first you should know the cause of Blue Screen error. Though, there is no particular cause of this problem, so I will discuss all of the related causes in this article. Here is a detailed information and tips to fix Blue Screen Memory Dump Error in Windows PC. It has been seen that many of the users complain about this problem when they switch from one Windows to another. If a culprit program, driver or software that has been recently installed in your system. It can also cause Blue screen error. It may be caused due to a corrupted or invalid registry. Viruses also cause Blue Screen Memory Dump error. Blue screen error is mostly seen in Windows 7. A newly installed hardware can cause Blue screen error. It could be due to a defective hardware attached to your PC. A damaged hard drive could also cause Blue Screen Memory Dump error. Most often, a defective RAM causes Blue Screen Memory Dump error. Overheating, CMOS and memory module also causes Blue screen error. As I have discussed the most probable causes of Blue screen error above, the fixing process still remains a question. Well, it is difficult to figure out the particular cause of error in your PC and info at the blue screen also does a little help. Therefore, it is better to go through a broad correction strategy to solve the issue. Now, I am gonna share some fixing process, tips and tricks to rectify the Blue screen Memory dump error in your Windows PC. SLOW PERFORMANCE: INCREASE COPYING SPEED IN WINDOWS XP/VISTA/7/8. At first, check whether the error is due to software problem or hardware problem. This can be done by running your system in SAFE MODE. If your system works fine in Safe mode without crashing then the error is software related. To fix the software related problem, follow step 1, 2, 3 and 4 ….. If it crashes during Safe mode then the problem is hardware related. To fix Hardware related problem, follow step 5, 6,7,8…. or consult a well qualified hardware technician. 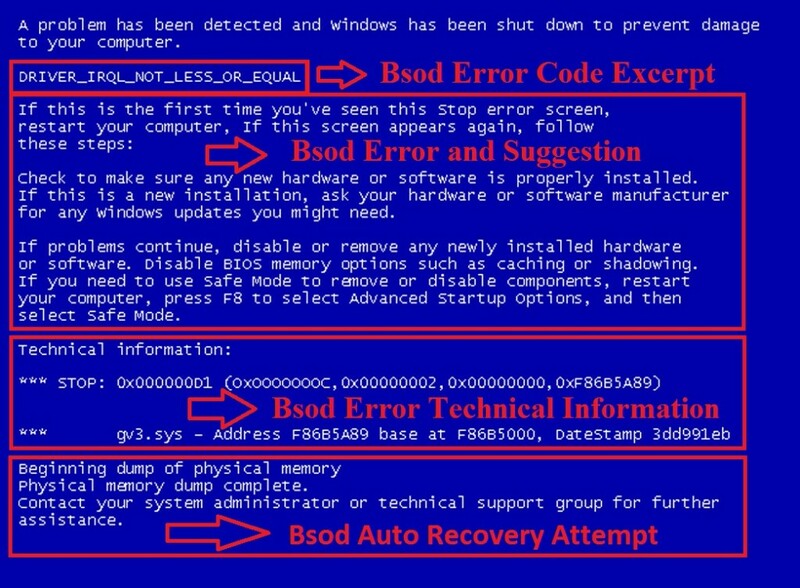 The BSOD error often occur due to corrupt or invalid registries. If you have a brief knowledge about registry then edit it by yourself or else prefer a third party software. Don’t risk for the editing or else it could damage your whole Windows. Try a program called CCleaner to clean the registry. Download it from here. Most often, Blue screen memory dump error is also caused by Virus. So, install a good antivirus and scan your whole system. If you are a Windows 7 user and you are suffering from Blue screen error then you can follow this step. Windows 7 has provided an official update called Hotfix to fix this error. To download the update, click on the below link. If the problem is software based and above two steps did not help. The, try installing a fresh copy of Windows. Prefer Windows XP. Do not opt for Windows 7. Windows 7 is most vulnerable to Blue screen memory dump error. Try updating the latest hardware drivers or re-install it. Check for the compatibility of hardware with your system. Prefer using a third party software to find the compatibility of hardware. Almost at 90% cases. the blue screen error arise due to RAM problem. Try to change the RAM and see if it works. Always use right pair of RAM on your motherboard. Also, sometime the RAM port also becomes faulty and causes this error. BOOST YOUR RAM MEMORY BY USING USB PENDRIVE AS RAM. Sometimes, Blue screen memory dump error arises due to faulty Hard disk. It happens when the system cannot read memory from Hard disk. Also try to check out the SCSI (Small computer System Interface) terminator. If the error message on the BSOD reads “UNEXPECTED_KERNEL_MODE_TRAP”, then it signifies that there is a problem in the memory of your computer. Check the CMOS (Complimentary Metal oxide Semiconductor) and SIIMS (Single Inline Memory Modules) in your CPU. It is often caused due to overheating or faulty power supply. WannaCry: Could It Have Been Avoided?